Have you recently lost or misplaced your Bank Passbook? Don’t know what to be done next to get duplicate or new passbook issues from bank? Then this article will help you out on how to get new or duplicate passbook re-issued when old passbook is lost or misplaced or stolen. You may hold Bank Account in any banks, the process of getting new or duplicate passbook re-issued is same. 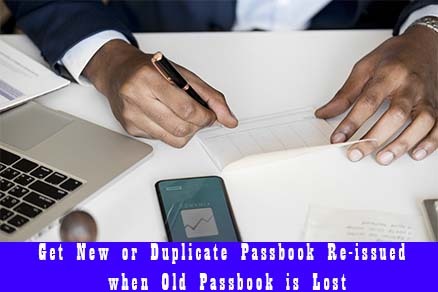 To request for new or duplicate passbook you will have to definitely visit the respective bank branch, but also you will have to submit a written application to re-issue a new or duplicate passbook. Below is the complete process explained on how to get new or duplicate passbook re-issued when old passbook is lost or misplaced or stolen. To get new passbook re-issued there is no requirement of any documents, but you will have to visit the branch where you hold the bank account. Take an A4 white paper and write an application to the branch manager requesting to issue a duplicate passbook. The application or letter should contain your name that is account holder name, bank account number, and registered mobile number. For your reference below we have a sample format of application or letter requesting to re-issue duplicate passbook. I (YOUR NAME) maintain a savings account with your branch regret to inform you that I had lost my pass book in transit and I am in need of duplicate passbook in order to know the details of transactions in my account. Hence, I am kindly requesting you to issue me a duplicate passbook as soon as possible. You can write the application in above mentioned format and submit it to your branch. The Bank Branch Official will inform you when to collect the duplicate passbook. You can then visit the bank on that day and collect your duplicate passbook. That’s it, this is how one can Get New or Duplicate Passbook Re-issued when Old Passbook is Lost.